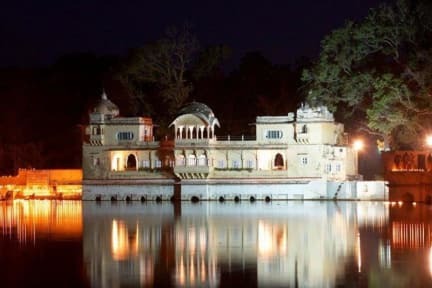 Raj Mahal Guest House is located in a heritage building which in more than 150 years old, which is renovated couple of years ago..
Raj Mahal Guest House it self has an ancient view inside and importance as a heritage. 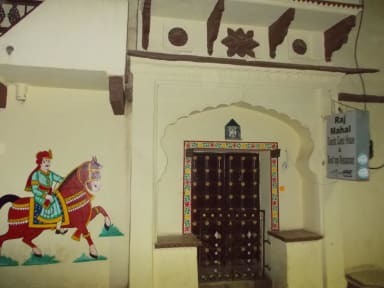 This building is called amar singh ji ki haveli' here in local language. It was really great Hotstel. Hostel owner was so kind, he came to pick me up from Railway Station. Lovely place I felt very much at home, wonderful people and good food, also best best location ever literally right in the heart of bundi. Great little hostel in Bundi! You can't beat the price.. Some of the mattresses weren't very comfy, but for the price I can't complain! The staff even came and picked me up from the train station for less than I would pay for a Tuk Tuk! I had a great stay here! Great location close to fort and in middle of Bundi. Staff are very friendly and helpful. Amazing location and clean rooms. Although they did not clean the bedsheets between guests. Well priced resteraunt upstairs. Great owner who will help you out with anything and even picked me up at the railway station. Bundi was one of my favourite places in India! The palace and the fort were incredible! The guy working there was super helpful and booked a few things for us, not really anyone here. I ordered Veg fried rice and literally got white rice with peas in it. And at the end when paying he wouldn’t take a 10rs because it was coloured a tiny bit. The staffs are very nice. I got help to book train ticket to Jodhpur. The meal is very tasty. But my toilet was dirty and I have to clean it. The shower was cold. I got flu from bed. Make sure check at bed and cleanliness before you confirmed the room. Location is perfect! The guest house it's ok. The owner is nice. Hot water for a shower it's not good at all and the toilet was not cleaned. The building is nice and the dorm is fine too. Good location, nice manager but filthy room - smeared stains on the wall, crumbs on the sheets and brown stains all over the toilet seat - I cleaned it myself with antibacterial hand wash and toilet paper and there was thick brown dirt coming off everywhere. It was like the bathroom hadn't been cleaned for months. To be fair, the manager did offer to wipe the toilet seat before we saw it - it was late and we said he could do it tomorrow - we weren't expecting it to look like that though! Cheap option to stay in. Dorm has no A/C neither window, it gets really hot inside. They can cook if you ask them too for a cheap price as well.